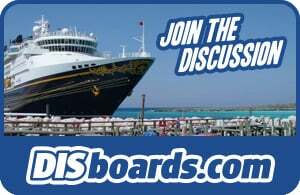 The Disney Cruise Ships are the destination, but there is so much to do onboard for guests of ages! Family Fusion - Guests take the stage to test their knowledge of their families and see how well they can work together in a series of challenges. Anyone Can Cook - Learn how to disguise healthy food, create a romantic dinner, and much more. Towel Folding - Learn how to make those amazing towel animals that you've been finding in your staterooms. Each evening at the Walt Disney Theatre, a special show is offered for your entertainment. On the Disney Wonder there are the Broadway caliber productions of The Golden Mickeys, Disney Dreams and brand-new show, Frozen, A Musical Spectacular. On the Disney Magic there's Tangled: The Musical, Disney Dreams and Twice Charmed, An Original Twist on the Cinderella Story. On some voyages you may be treated to a "Prem-Ear" of a new blockbuster Disney movie, or a variety show. 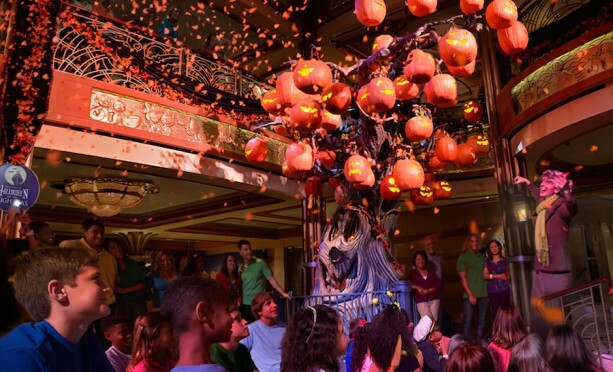 The Disney Dream presents 3 stage shows. Disney's Believe, is a 50-minute show featuring over 20 popular characters like Cinderella, Peter Pan, Mary Poppins, and Belle. It tells the story of a busy father who learns a lesson about the important things in life, like spending time with his daughter. The Golden Mickeys: A Timeless Tribute is a popular show from the Wonder and the Magic, but has a few new twists onboard the Dream. The Little Mermaid's Ariel performs an aerial ballet and the Tangled characters, Rapunzel and Flynn Rider perform a romantic duet. Beauty and the Beast is the newest production to join the incredible lineup. This version of the tale as old as time was inspired by Disney’s live-action adaptation of the animated classic. The show utilizes the most imaginative elements of both the live-action and classic films. The Disney Fantasy presents 3 stage shows - Disney's Believe, Disney Wishes, and Disney's Aladdin - A Musical Spectacular. Disney Wishes is a 45-minute musical tells the story of three friends celebrating high school graduation with a trip to Disneyland. The friends are learning about growing up and what to expect in the future, which leads to several musical numbers with Disney characters. The show involves scenes and characters from Tangled, Lilo and Stitch, Jungle Book, and many others. Wishes ends with the song Breakthrough from the Disney Channel movie Lemonade Mouth. Disney's Aladdin: A Musical Spectacular is a musical comedy with many of the classic scenes and songs from the film. 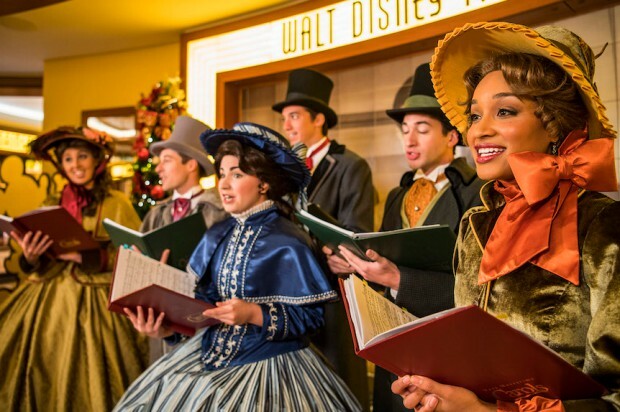 At times, performers will be in the aisles of the theater, making guests feel like they're a part of the show. A new song, To Be Free, is included and was written for the show by Alan Menken, who composed the original score. There's also the Buena Vista Theatre on board which plays first-run Disney movies morning, afternoon and night, some in Digital 3-D. The theater is decorated in the Art Deco style of the 1920's and 1930's. In your stateroom, you can watch movies on the All Movie channel or the Disney Animated movie channel. You also have the option of watching first run Disney films in the Buena Vista Theater (these can be live action or animated). Just because you're on a cruise ship, doesn't mean you can't keep up with your workouts! All the Disney ships are equipped with top of the line recreational areas. There are pools for every age group - from the Mickey Pool for the littlest ones, to the Quiet Cove Pool for adults only. Every kind of sport you can imagine is available - basketball, shuffleboard, ping pong, soccer, volleyball, and even golf! If you just want a traditional workout, visit the Fitness Center and check out the weight machines and ellipticals. Aerobic and yoga classes are offered and personal trainers are available if you need a little guidance. Halloween Isn't Just for Kids! Adult can join in on the fun with a nighttime celebration in the entertainment district, including a costume contest and a Villainouse Takeover on the dance floor. NOTE: NO WEAPONS ALLOWED. If you plan on being a pirate, leave your plastic cutlass at home as no weapon, real or fake, is permitted. A Thanksgiving feast will be served. Mickey and Minnie will be meeting and greeting guests while dressed in traditional Thanksgiving garb. Kids will enjoy holiday crafts and the jumbo LED screen Funnel Vision will feature the NFL football games being broadcast that day. 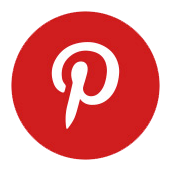 Santa's Winter Wonderland Ball - Wear your holiday finest and come to the ball with your Disney friends and the princesses. There will be singing, dancing, treats and a snowman will transform into Santa Claus! Magical snow will fall in the atrium courtesy of Queen Elsa. Sunset Hanukkah services and Christmas services, including midnight Mass on Christmas Eve. The tram is decorated like a reindeer with antlers and a tail. Celebrate the ways of The Force with classic and new Star Wars characters on select sailings aboard the Disney Fantasy in 2018 and 2019. The day includes character interactions, activities, and entertainment, including a thrilling fireworks show and deck party featuring Rey. Experience activities featuring your favorite Marvel characters on select sailings aboard the Disney Magic from Miami in 2019. The day includes character interactions, activities, and entertainment, including a thrilling fireworks show and deck party featuring over a dozen super heroes (and villains). 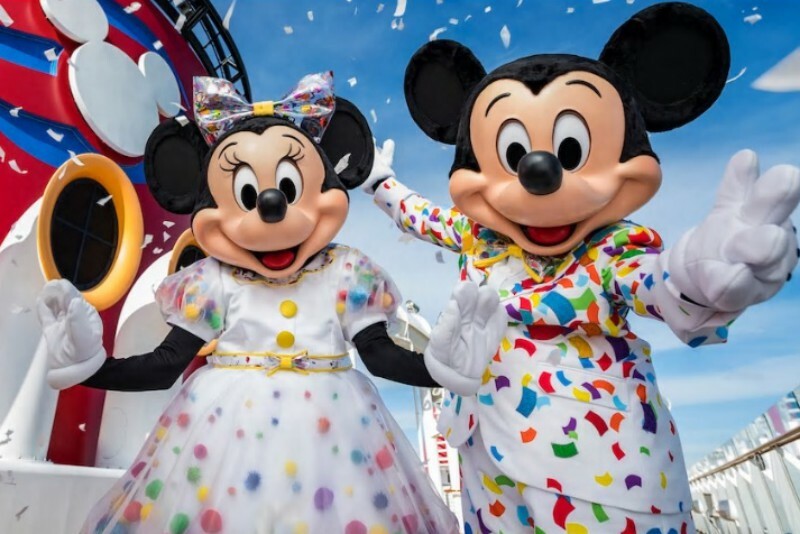 Celebrate Mickey & Minnie's 90th birthday with a party at sea! The party features all new music and special surprises. The fun starts with a special invitation and party hats delivered straight to your stateroom, then during the afternoon, enjoy a special deck party with Mickey, Minnie and all their pals dressed in their festive best. 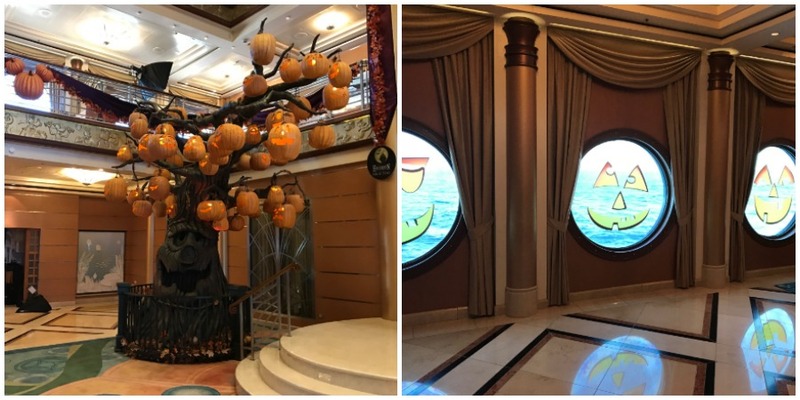 In addition to special themed treats, look for commemorative merchandise, including t-shirts, souvenir cups, and stateroom magnets.